This week was a busy one marked by the hitting of a solid and sturdy wall by the end. So, most of this week’s media revolves around getting out of a funk (or wallowing in it). With that in mind, with all that has been going on (the most of which––is that a saying?––has been prepping for the new semester of school), this week is going to be rather light fare. It’s no secret (though it’s often a surprise) that I’m a heavy metal fan. My brief brush with internet fame due to my art getting shared by Twisted Sister all but solidified that for the world. However, as much as I love Twisted, when it comes to heavy metal for my general listening pleasure (and I’m burned out on Twisted Sister), my tastes run much darker or, to use the parlance of the genre, doomier (I made that word up, but I’m an English teacher, so it’s legal). Actually, my tastes are very specific. I like grungy, chunky guitars but melodic vocals. I like slower metal but not droning repetition. It’s an aesthetic established by my love for Dawnbringer who not only checks all of those boxes but they established the boxes in the first place. 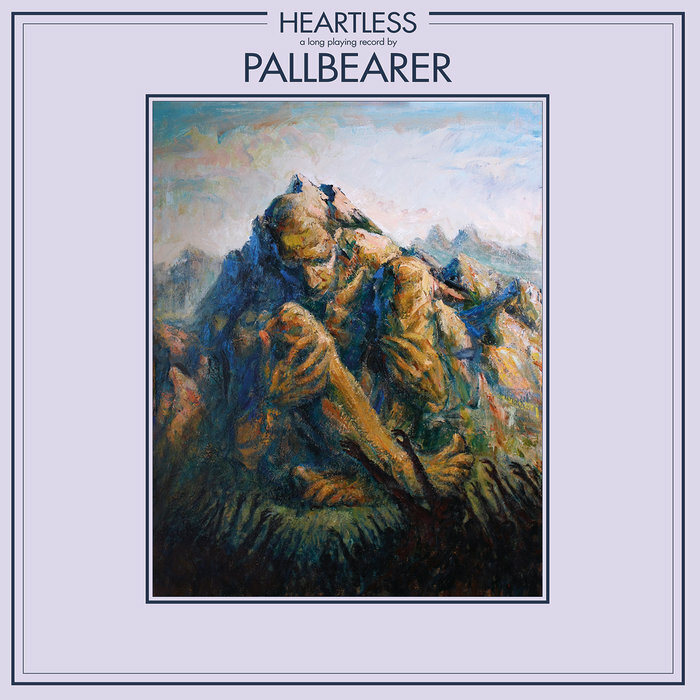 I actually found Pallbearer through a guitar magazine (I’m a guitar nerd, too) and loved what I heard on their newest album, Heartless. When it comes to this type of music––Dawnbringer included, to an extent––the importance to me is less the lyrics and content of the songs but more of the overall tone everything creates. Pallbearer’s album creates a sound that is a mixture of heaviness (the instruments) and wist (the vocals) that keep it from being a complete wallow in teen angst and more a tour through a set of emotions I experience a lot while drawing: utter despair and mournful hope. On Wednesday, the cover for Chapter 3, “Making Smoke” was unveiled on the website, along with a bit of behind-the-scenes information. This week, I really started feeling the weight that comes with the knowledge that the end of the chapter is right around the corner. With that, a negative aspect of my creative process really came to light (causing the dreaded “wall” mentioned at the beginning). In my writing classes, we spend some time talking about a thing called “writer’s block”, a phenomenon most of us have experienced but ignore its actual cause. We tend to define writer’s block as a state where ideas are lacking, where we’ve drawn a blank or our ideas are blocked by unknown plaque. In response to this, I have my students read a wonderful article by Donald Murray called “Write Before Writing,” in which he discusses writer’s block actually being a result not of obstruction but of exhaustion. We can’t write because our brains are tired doing the same old thing, our go-to processes that “always” work…until they don’t. In most cases, it can be solved by simply trying something different––whether a different tactic or simply doing your normal thing but in a different place. Knowing this, whenever I hit my wall I know what I have to do (something different), but it doesn’t stop the anxiety, which is my oldest and fiercest enemy, an enemy I have no defense against. I often make the joke that I’m an artist that hates drawing. A more accurate way to say it would be that I’m an artist who is scared to draw. Every time I sit down to draw a page, I freeze. 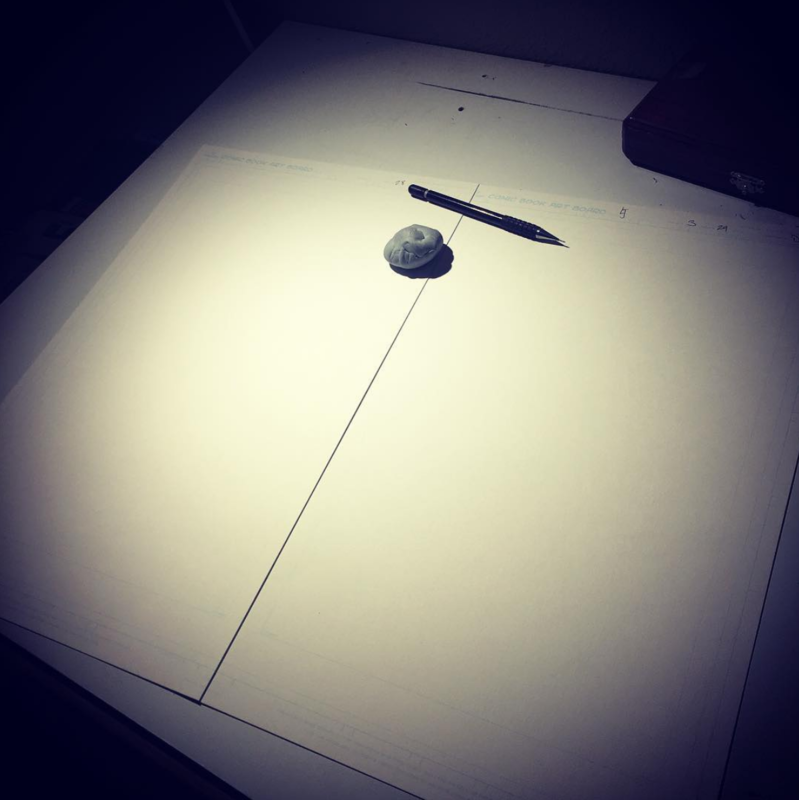 Even when I have the page thumbnailed out and I know exactly what to do––there’s still that hesitation, that fear. This double-page spread has sat blank on my desk for two days. I always push through it and I know that this anxiety will always creep up at the start of a page, but that never helps. To this point, I have drawn almost 400 pages of comics over my 10 years of comicking, almost 100 pages of Long John at this point, and there are no Long John pages that I think are bad, but still––even with all that work behind me––I still get scared. It will pass, but the feeling never leaves and, as the end of chapter 3 quickly approaches, may even get worse. But I’ll get there. I know that much. 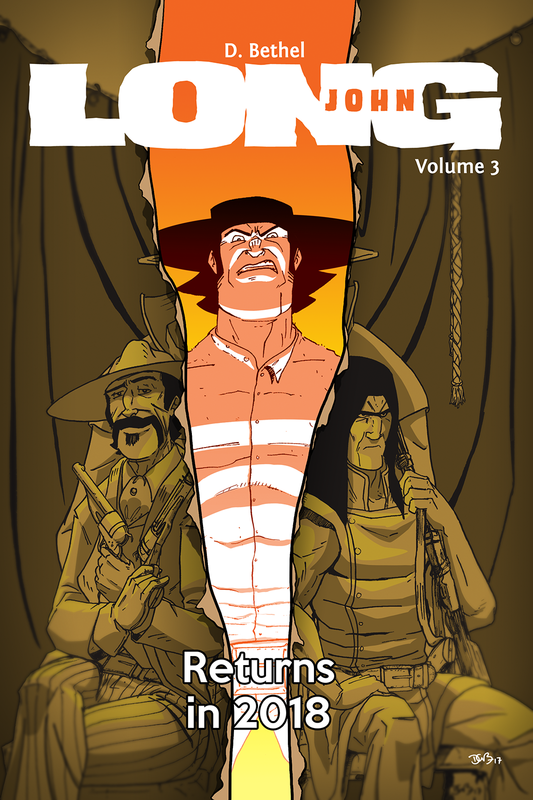 In other news, Long John, Volume 2 will be back in stock shortly, so expect a bundle of volumes 1 & 2 to go up on the store post haste and at affordable prices.